I'm one very proud mum. My gorgeous boy has already mastered some of the more advanced crochet techniques - at only 15 months old! 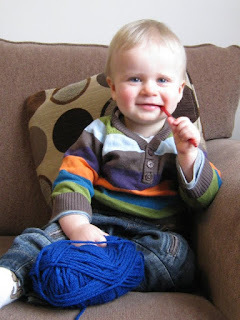 You can see him here at his most relaxed with some chunky yarn and one of my new funky coloured crochet hooks which he is chewing while contemplating what he wants to make. See that glint in his eye? Yup that's the excited glint we all get at the start of a project when the possibilities are endless. My husband though had ideas for that yarn himself and was very specific about what he wanted - a nice snug pouch for his new laptop was the order of the day. So this little boy was ordered to get to work and after a day of working those tiny fingers hard he had produced a very attractive pouch which also featured a space invader on the front. The buttons and button loops were then sewn on by me as Sam is still a little small to be dealing with sharp needles and hey presto - the pouch is finished. A good few of my husband's work colleagues have admired this geek-tastic pouch but to no avail as Sam has decided that he needs a little break before taking on his next crochet challenge - but I for one can't wait to see what that might be! I am in total shock you 15 month old made that?! What a talented lil tot indeed! Wow! What a talented (and coordinated! )little cookie-cruncher. I bet you're proud to the nth power!! !